"This tastes sooo good! It's very easy to make and so many different ways to present it!" Whisk French vanilla pudding mix with milk in a large bowl until softly set, about 2 minutes. Pudding will thicken as it stands. Cream confectioners' sugar, cream cheese, and butter in a separate bowl until smooth and creamy. Stir cream cheese mixture into pudding until thoroughly combined; gently fold frozen whipped topping into the mixture. Place half the cookie crumbs into the bottom of an 9x12-inch dish; retain remaining crumbs for topping. Spread the filling over the layer of cookie crumbs and top with remaining crumbs, covering completely. Chill for at least 30 minutes. Try this no-bake dessert that's perfect for fall and Halloween! We enjoyed this! It was nice to have a variation of this dessert that isn't all chocolate. I will make this again for the kids. It was definitely wayyy too sweet for me. I could only eat a spoonful. Next time I will cut back on the sugar. This recipe was so good, my whole family loved it! I didn't use the butter and it didn't seem to make a difference...it turned out great!! 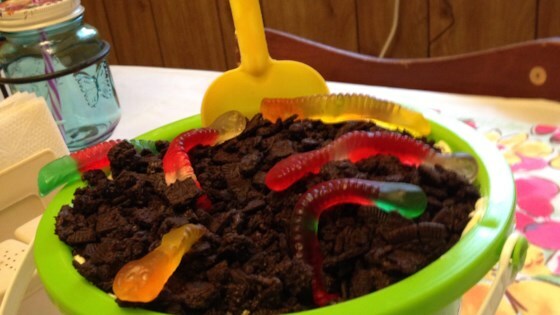 This is the desert my little girl makes for family gatherings and everyone seems to love it. My family loved this. Used chocolate pudding instead of vanilla. And did a full pack of cookies. Delicious! My sister makes this all the time.She calls it "Texas Snow"